The decorative elegance of Art Deco does not immediately call to mind something so utilitarian as rubbish incineration. But enter one of the world’s most pre-eminent modern architects, Walter Burley Griffin, and majestic form becomes imaginatively fused with functional necessity. 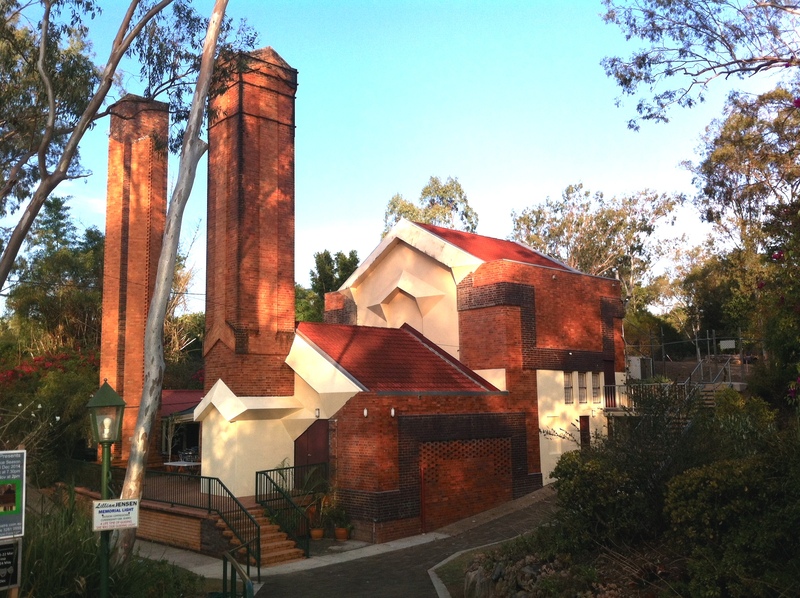 This is exemplified in Ipswich’s stately Queen’s Park, where The Walter Burley Griffin Incinerator – known today as the Incinerator Theatre – boasts the distinction of being Griffin’s only architectural legacy in Queensland. The story of Griffin’s time in Australia is a renowned one. 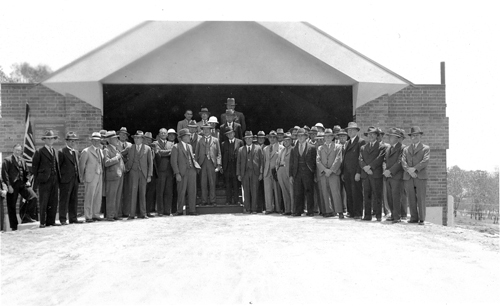 Born and educated in America and working under the tutelage of Frank Lloyd Wright, in 1911 Griffin entered an international competition to design Canberra as Australia’s future capital. Winning from 137 entries, he moved to Australia in 1914 and spent the next 20 years of his life here, alongside fellow architect and wife, Marion Mahony Griffin. Although his vision for Canberra was never fully realised and he resigned from the project in 1920 after a series of bureaucratic frustrations, the Griffins’ impact on Australia’s built environment has endured. Together they worked on more than 250 designs for civic buildings, suburban estates, universities, cinemas, theatres, industrial buildings, houses and furniture. Their trademark aesthetic was a modern one independent of past styles, seeking harmony with the natural landscape. In 1929, as the Great Depression ravaged the economy and the demand for residential architecture declined, Griffin established a partnership with a colleague, Eric Nicholls, to design incinerators for the Reverberatory Incinerator and Engineering Company (RIECo). RIECo had formed that same year to promote a new system of incineration patented by an Australian engineer, offering more efficient waste disposal that eliminated smoke and noxious gases. In addition, RIECo set itself apart from its competitors by promising municipal incinerator designs of aesthetic as well as functional value. This is where Griffin and Nicholls brought their skills to bear. Of the thirteen incinerators Griffin and Nicholls designed for RIECo, only seven survive today including the Ipswich example. The Ipswich City Council called for tenders to construct an incinerator in 1934, the culmination of many years of political and community debate. As Ipswich grew in size, residents expressed a need for more modern methods of waste disposal. Newspapers at the time reported community concern about the health impacts of rubbish tips, described as ‘cesspools’ of bacteria. This was backed up by the Ipswich Health Inspector who raised concerns about vermin and chronic stenches emanating from local tips. A State Government loan was raised to cover the £5500 cost of transitioning to incineration, regarded more scientific and hence more ‘modern’. However, settling on a site for the proposed incinerator proved contentious – in part a case of no-one wanting it in their own backyard. When Queen’s Park was initially identified in 1932 as the preferred site, 147 residents who lived in the vicinity signed a petition arguing the incinerator would become ‘a source of annoyance’, likely to produce an offensive odour affecting property values. The State Health Officer agreed, citing a park of natural beauty as no place for a utilitarian building. Council in turn rejected the State Health Officer’s suggestion of an alternative site near the North Ipswich gasworks, believing it too far out of town, instead settling in 1934 on the centrally-located Thorn Street quarry reserve in a close contest of six votes to five. However a year later, once RIECo’s tender had been accepted and work had commenced, things came full circle when the quarry’s foundations were deemed unsuitable to support the structure. After years of disagreement and delay, in what must have felt like a case of bureaucratic déjà vu for the local community, the original proposal – Queen’s Park – was revisited and finally endorsed. 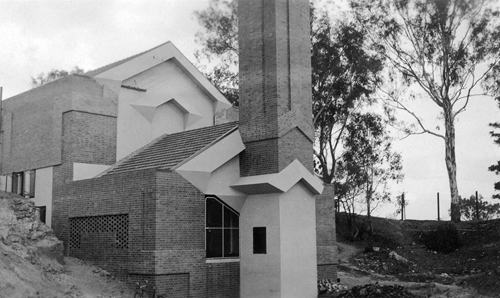 Walter Burley Griffin’s design philosophy infuses the incinerator, in particular his belief in integrating buildings into the landscape in ways that respond to the inherent qualities of a particular site. In this case, the incinerator was built into the side of a hill, which not only respected the natural surrounds but also functionally supported the process of incineration. Trucks would back in towards an opening at the top of the building to dump rubbish, received by staff waiting (and sweating!) in the middle layer who would stoke it into a furnace below ground heated at 1200-2000 degrees fahrenheit. The reverberatory technique offered by RIECo meant rubbish was dried before burning, eliminating odours that local residents had feared and producing ash that could be reused in road and footpath construction. While architects of national and international acclaim have dominated this story so far, the project also had a local flavour. Construction was supervised by Ipswich architect George Brockwell Gill, potentially inspiring his own Art Deco design for the local Baptist church soon after. With the exception of fittings and fans, all materials were procured in Ipswich and surrounds, including bricks from Rylance Collieries and Brick Works and iron and steel work from Forrers’ Pty Ltd.
As for Walter Burley Griffin, he left Australia in 1935 before his design for the Ipswich incinerator had come to fruition, and died two years later in India without ever seeing it. In 1940 a second chimney was added by Griffin’s partner, Eric Nicholls, in response to the city’s rapid expansion. By the 1960s incineration had fallen out of favour due to its environmental impacts and council considered demolishing the building. However, a community campaign saw it retained and converted into an intimate theatre space still enjoyed today as a popular site for local productions by Ipswich Little Theatre. If you are inspired to seek out Walter Burley Griffin’s other incinerators, make a stop at Glebe (NSW), Willoughby (NSW), Canberra (ACT), Essendon (Vic), Hindmarsh (SA) and Thebarton (SA). The Ipswich Incinerator was added to the Queensland Heritage Register in 1992. Walter Burley Griffin Incinerator, 2014. Photographed by Queensland Deco Project. 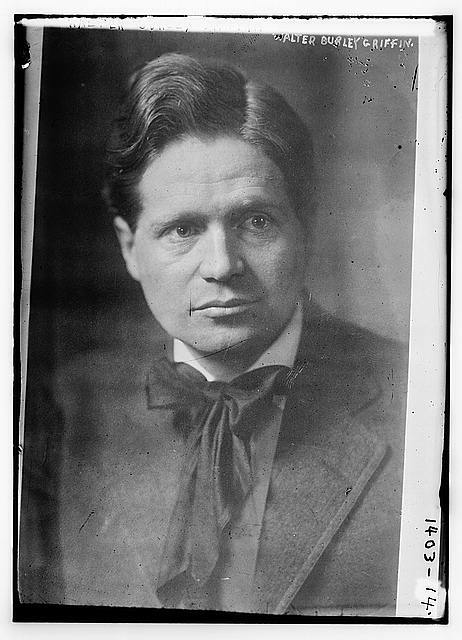 Walter Burley Griffin, date unknown. Courtesy of Bain News Service, George Bain Collection, Library of Congress. 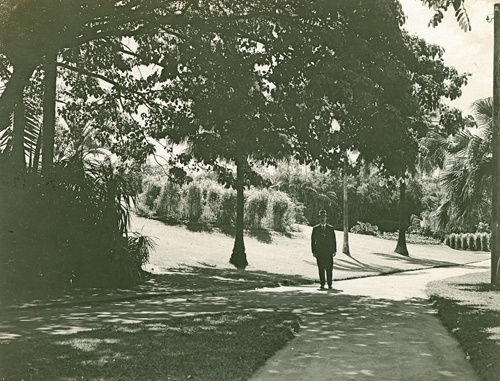 Queen’s Park, Ipswich, 1930s. Photographed by Frederick Harold Rogers. Courtesy of Picture Ipswich. 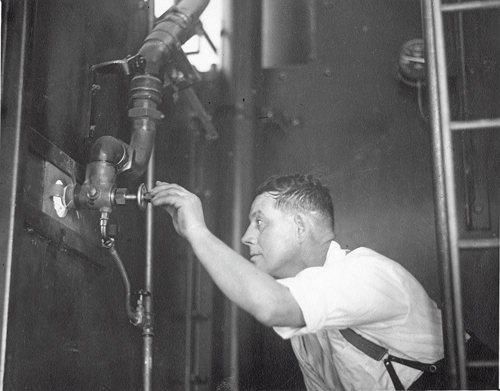 Interior of the Incinerator Theatre with unidentified man priming furnace with oil injection, Ipswich, November 1936. Courtesy of Picture Ipswich. Rear view of Incinerator Theatre, 1936. Courtesy of Picture Ipswich. Official opening of the Incinerator, Ipswich, 5 November 1936. Courtesy of Picture Ipswich. ‘By One Vote. Redhill Quarry Chosen Site for Incinerator.’ Queensland Times (Ipswich). 12 May 1934, p.8. ‘City Incinerator. Big Petition Lodged. Council Discussion.’ Queensland Times (Ipswich). 22 November, 1932, p.6. ‘Incinerator Tenders.’ Queensland Times (Ipswich). 3 November, 1934, p.8. ‘Ipswich Garbage. Need for Incinerator.’ Queensland Times (Ipswich). 30 November, 1932, p.5. ‘Ipswich Incinerator Opened. Most Efficient Method of Garbage Disposal. Memorable Function in Queen’s Park.’ Queensland Times (Ipswich). 6 November, 1936, p.8. ‘Ipswich Incinerator Site.’ The Courier Mail, 3 August, 1935, p.10. ‘Official Opening of Incinerator.’ The Courier Mail. 13 October 1936, p.12. Reeves, Simon. ‘Incinerations and Incantations.’ In The Griffins in Australia and India: The Complete Works and Projects of Walter Burley Griffin and Marion Mahony Griffin. Edited by Jeff Turnbull and Peter Y. Navaretti. The Miengunyah Press, Melbourne University Press, Melbourne, 1998, pp.64-72. ‘Start in August. Ipswich Incinerator. Inspected by Alderman.’ Queensland Times (Ipswich), 20 July, 1936, p.6. Walter Burley Griffin Society Incorporated, website. 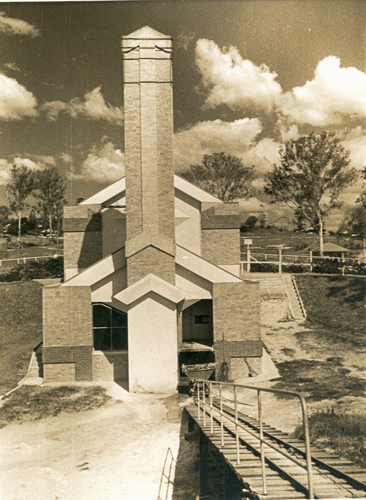 ‘Walter Burley Griffin Incinerator (former).’ Queensland Heritage Register. Department of the Environment and Heritage Protection, Brisbane, 1992. ‘Walter Burley Griffin Incinerator.’ Ipswich Heritage Trails. Ipswich City Council, 2014, Video. What an interesting and informative story, and a bit funny for local Ipswich (gasworks out of town!) Love visiting Canberra for the architecture and know the story there. Be interesting to see some of the other incinerators on our travels. Plus have fond memories of going to the Incinerator Threatre!